Part of the Tuatha Dé Dannan (the supernatural race that dwell in the Otherworld in Irish Folklore and Mythology), this Celtic Mother Goddess is also revered as Saint Brigid in the Catholic calendar, especially cherished in Ireland. 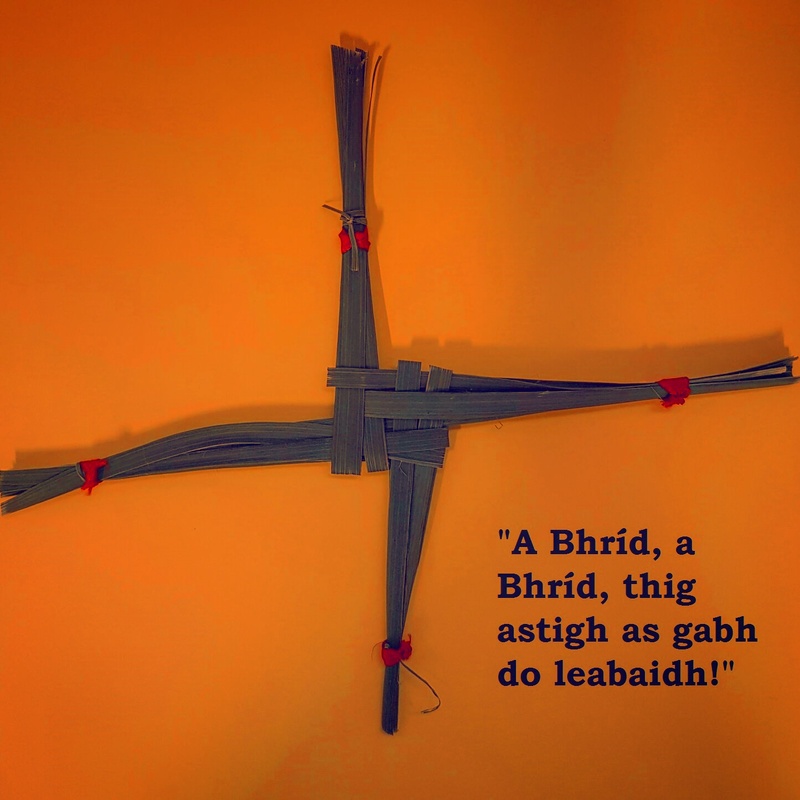 Every year on February 1st, children all around Ireland make Brigid’s Day crosses to honor her- the photo here is of one made by one of the students in my sister’s primary school class today! February 1st marks the first day of the return to spring, Imbolc. As the Irish language has evolved over time, we cannot be certain where the term originated from but many believe- and it is the theory that most resonates with me- that it comes from the term ‘I mbolg’ or ‘in the belly’. Spring being the lambing season, this is the time the well-being of the flock would be at the forefront of the minds of the farming people. Brigid was appealed to for blessings for the lambing season and for the home. Purifying fire ceremonies were done in her honor. The poem in the photo “A Bhríd, a Bhríd, thig astigh as gabh do leabaidh” means “Brigid, Brigid come in and go to bed”. 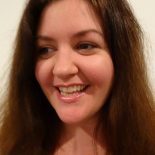 It is from a time that the custom was to literally welcome Brigid into the home by making up a bed for her. The tradition of making Brigid’s Day Crosses also originates from this time, placing them over the doors and windows in your house brings blessings and protection to the home. She is the patroness of Poetry, Healing, Blacksmithing, Divination, Prophecy and Inspired Wisdom. Known also as Breo-Saighead (Fiery Arrow), she brings divine justice. Her bright light brings light to the home and within. As such, Fire Ceremony, especially at a high elevation (as she is the Goddess of high places both in form and without form- elevated consciousness, high thinking etc), is a beautiful way to honor her. Hers is a magnificent, powerful and graceful energy, and one I feel a strong and profound affinity for. So I wish you many blessings on Brigid’s Day. May you bring her lightness with you through the rest of winter into spring! Thank you for those Blessings Laura.. And such a wonderful day to remember her wisdom and healing energies..
Nice to note that February has such auspicious associations in Irish culture. Thanks, Laura, for the blessings and may these blessings remain with you for the remainder of the year now running through its first quarter. I am a februarian, meaning this is my birth month, which makes me all the more happier. Well thank you. I certainly need some spring thinking! This entry was posted on February 1, 2017 by laura kilty in Inspiration and tagged Blacksmithing, blessings, Breo-Saighead, Brigid, Brigid's Cross, Celtic, Cermony, Divination, Divine Feminine Rising, February 1st, Fire, Goddess, Healing, I Mbolg, Imbolc, Inspired Wisdom, Ireland, Irish, light, Midwinter, Otherworld, poetry, Prophecy, Saint Brigid, Solas, Spring, Tuatha Dé Dannan.